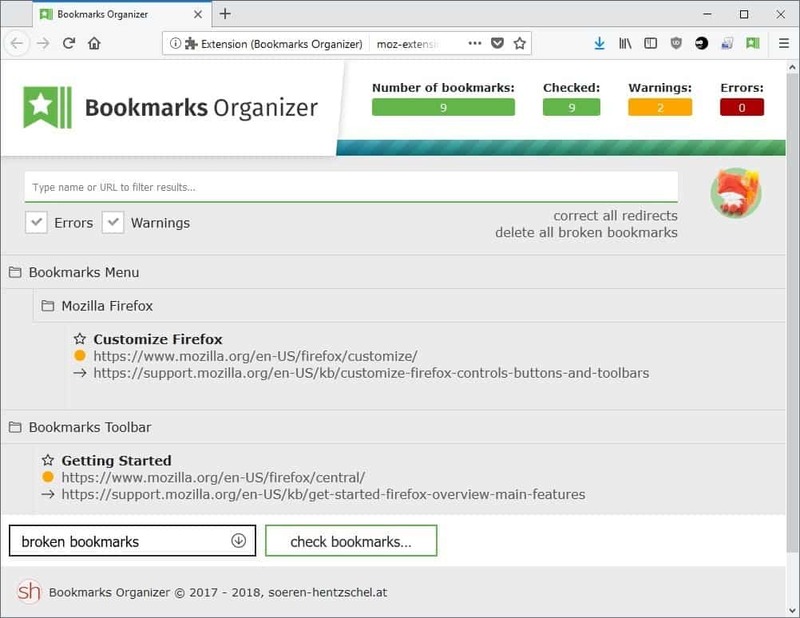 Bookmarks Organizer 2.0 for the Mozilla Firefox web browser is a major update to the bookmarks management WebExtension that Sören Hentzschel, the developer of the add-on, launched last year. Bookmarks Organizer is a management extension for bookmarks that is primarily used to detect duplicate, broken and redirecting bookmarks. Firefox users may correct issues, for instance by deleting bookmarks or fixing redirects, using built-in tools. You can check out our initial review of Bookmarks Organizer here. Bookmarks Organizer 2.0 requires Firefox 59.0 or newer as it makes use of new functionality introduced in that version of the web browser. The core functionality of the bookmarks management extension remains the same. You can run checks on all bookmarks to find duplicate, broken or redirecting bookmarks. The extension lists all bookmarks with errors or warnings in its interface. The screenshot above highlights two redirecting bookmarks, and Bookmarks Organizer displays the redirect target conveniently in the results listing. You may correct all redirects or delete all broken bookmarks with a click on the links in the interface, or manage bookmarks on a case by case basis. Just hover over any result to display options to delete the bookmark, correct the redirect, or edit the bookmark. Bookmarks Organizer 2.0 features many under-the-hood improvements. One complaint that some users had when version 1.0 of the extension was released was that the checks did not stop sometimes. 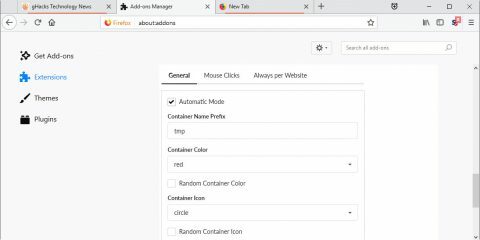 Pre-Firefox 59 WebExtensions had no means to terminate these requests which in turn meant that users did not see any results as they were displayed after the scan to improve performance. The new version of the Firefox extension uses request throttling to prevent too many request executions at the same time. The functionality may prolong the scan time but it reduces the number of false positives as fewer broken URLs are found during scans. Bookmark Separators no longer included in total number of bookmarks and results listings. The keyboard shortcut moved to Shift-F11 to resolve a conflict. Fixed the second bookmark check using a different method as it was not run sometimes. Translations for various languages available. Bookmarks Organizer is a useful Firefox extension for Firefox 59.0 and newer installations. 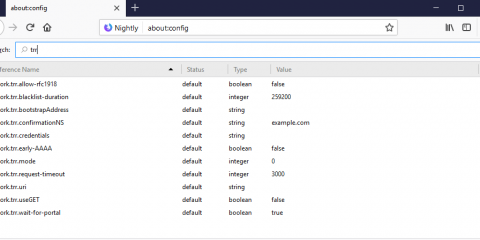 Firefox users who use bookmarks may find it useful to find broken and redirecting bookmarks to resolve the issues or remove bookmarks if they can’t be resolved. Now You: Do you use bookmarks in your browser? Ghacks needs you. You can find out how to support us here or support the site directly by becoming a Patreon. Thank you for being a Ghacks reader. The post Bookmarks Organizer 2.0 for Firefox released appeared first on gHacks Technology News.